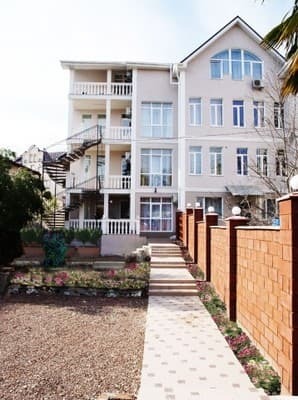 Hotel "Anna" is located on the central street of Yalta, 15 minutes walk to the sea, which is very convenient for beach holidays, business trips, and for caravanning. The hotel offers various rooms: from double to six-bedded with the possibility of adding berths (an e-fold or an armchair-bed). In good weather, guests can make use of the barbecue facilities. The back yard has everything you need for it: garden furniture, BBQ, awning from the rain. In five minutes walk from the hotel there is a bus station and the largest in Yalta vegetable market. Across the street there is a 24-hour supermarket, 3 bank branches, notaries, BTI. Possible transfer from / to the airport, railway station, guide-interpreter services, booking tickets for excursions. Some of the staff speaks English. PRICES MAY CHANGE, IT IS REQUIRED TO RECEIVE INFORMATION FROM THE OPERATOR. 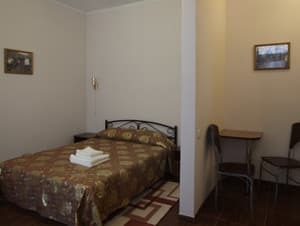 Description of the room: Two single beds of 90 cm, kitchen, dinette, refrigerator, air conditioning, safe, el. 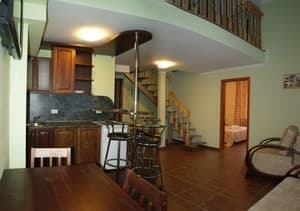 stove, electric kettle, bathroom, LCD TV with a diagonal of 22 inches, DVD, a spacious balcony. Bathroom: shower, toilet, washbasin, hair dryer. Description of the room: Spacious, bright room with a view on the street. Kievskaya. Double bed, kitchen, el. tiles, LCD TV with a diagonal of 22 inches, electric kettle, air conditioning, safe. Bathroom: shower, toilet, washbasin, hair dryer. Description of the room: Rooms with private entrance. Two separate beds of 90 cm or one double, kitchen, dinette, refrigerator, el. cooker, el. kettle. LCD TV with a diagonal of 22 inches, air conditioning, safe. Bathroom: toilet, shower, washbasin, heated towel rail, hair dryer. 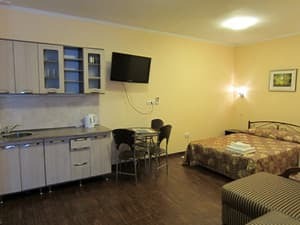 Description of the room: Spacious rooms with double or twin beds, kitchen, dining area, refrigerator, 22-inch LCD TV, electric kettle, el. stove, air conditioning, safe. Bathroom: shower, toilet, wash basin, heated towel rail, hair dryer. Description of the room: Rooms are located on the 1st and 2nd floors. Four beds - a double bed and a sofa bed. 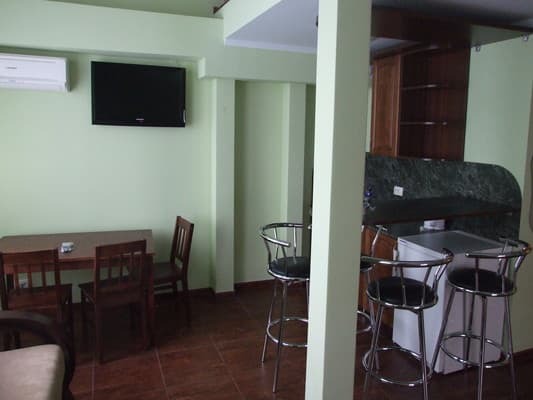 In the room: kitchen, dinette, refrigerator, air conditioning, safe, LCD TV with a diagonal of 22 inches, el. kettle, el. cooker, dishes. Large panoramic window and comfortable wicker furniture. Bathroom: shower, toilet, wash basin, heated towel rail, hair dryer. Description of the room: Room with private entrance. Two bedrooms, the first is equipped with a double bed, and the second is a large fold-out corner sofa. In a separate room that separates the bedrooms, there is a kitchen with all the necessary furniture, as well as an electric kettle. cooker, el. kettle, refrigerator, all necessary utensils. 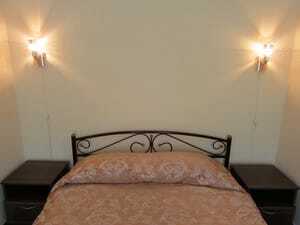 The room has a safe, air conditioning, LCD TV. Bathroom: toilet, shower, washbasin, heated towel rail, hair dryer. 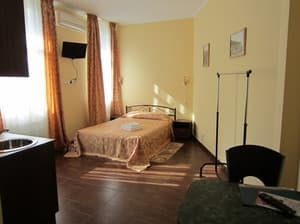 Description of the room: Large, bright, cozy rooms with two bedrooms. In the bedroom there is a double bed, in the living room there is a sofa. In one of the rooms - an armchair bed (extra bed). In the room: kitchen with breakfast bar, refrigerator, el. stove, LCD TV with a diagonal of 32 inches (in No. 14 - 22 inches), electric kettle, two air conditioners, safe. Bathroom: shower, bidet, toilet, wash basin, heated towel rail, hair dryer. 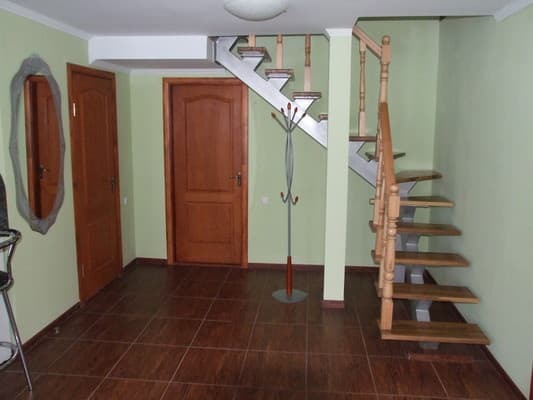 Отличный сервис и месторасположение отеля. хороший ремонт,чистое сухое белье, кондиционер. 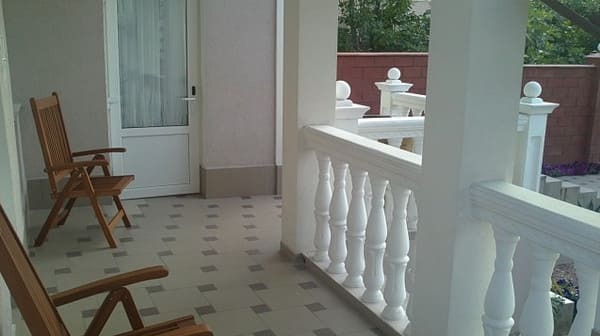 The hotel is located on the main street of Yalta, a 15-minute walk from the sea. Near the hotel there is the Yalta bus station and the central market. 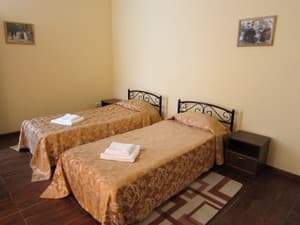 The hotel is located in a 5-minute walk from the bus station of Yalta.